Since the group was created, we have produced a number of volumes of dark fiction and verse… Sinister was our debut release, followed over the next few years by Bedside Manner, Sinister Too, East Scythe, Toxic Legacy, Dead Letters, Grave Matters. These are available in paperback or on Kindle from Amazon. 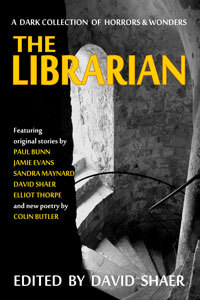 Released on 15 March 2017 and available from Amazon is The Librarian. A dishevelled writer struggles to finish his story, but is met with an invasion of the feathered kind, while a man takes matters into his own hands and dishes out gruesome levels of karma; we have someone who struggles to work out if he is dead or alive…or worse; a demonic, skinless terror that lurks in a damp, dark basement and a cryptic bookish clue causing no end of vile nightmares for an unassuming family. These are among the eight dark tales collected here, all revolving around a mysterious Librarian with horrors unearthed by digging into secrets that should never be uncovered and journeys to other-worldly domains that should never be visited. What fears and wonders are held there and what stories do they whisper in the dead of night? And who…or what…is the Librarian? THE CHAMBER OF KINGS • MISSING DAYS • THE KARMA CLUB • IT’LL BE YOUR TURN SOON • A GIFT OF CROWS • THE TRUTH KICKS IN • THE LAST STAND • FOREVER’S EDGE • plus a selection of poetry and verse.